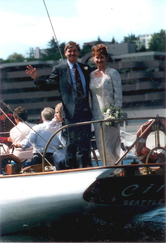 Stan Keck crewed on Circe in 1964, the same year owner Ray Cooke died. 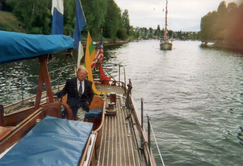 Circe was neglected and came close to sinking at her Lake Union mooring. Keck saw Circe in 1972 saying “I’ve never seen such a mess in my life.”. He subsequently bought 50% of Circe and began plotting its restoration from 1975 to 1980, when he began restoration. 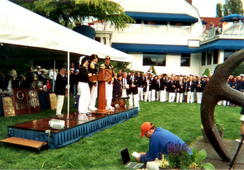 Circe has joined the Seattle Yacht Club Opening Day Ceremonies since the completion of her restoration in 1992. 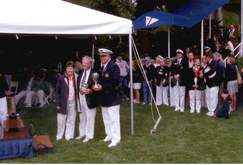 Since then she has won the classic boat prize numerous times. 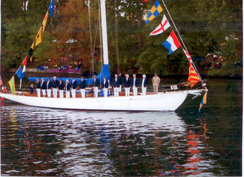 Circe is followed by the Virginia V in the parade of boats during Opening Day of boating season. Virginia V was commissioned in 1922. 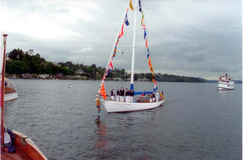 Circe was launched in 1932 from Lake Union Drydocks shipyard. 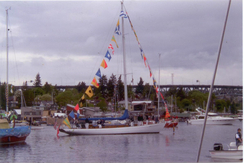 Circe also participates annually in the Classic Boat Festival in Victoria and the Port Townsend Wooden Boat Festival sponsored by the Wooden Boat Foundation.